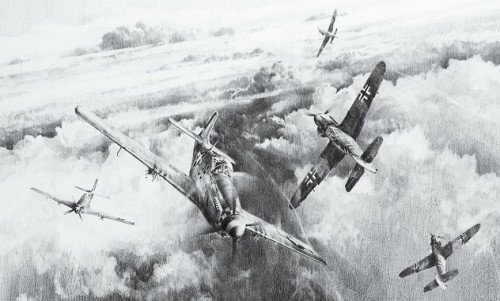 Robert Taylor’s superb drawing, part of his much-acclaimed Graphite Series, dramatically reconstructs one such clash in early 1945 as P-51 Mustangs of the 357th Fighter Group have spotted a group of Bf109s heading their way. Without hesitation they dive head-on in an attempt to break-up the enemy formation and for the pilots on both sides the explosive encounter of close combat is suddenly upon them. Limited edition prints of this classic Robert Taylor Master Drawing have been signed over the last few years by some of the most respected USAAF Mustang and distinguished Luftwaffe pilots who duelled in those merciless skies over Europe. Since signing the prints some of these legendary names have very sadly passed away, making it one of the most collectible editions of recent years. Knight’s Cross with 137 victories. Shot down the Me262 jet flown by legendary Ace Walter Schuck. Iron Cross with 3 victories.